Convenient, space-saving chairs stack up to eight high when not in use. Padded seat and back with durable acrylic upholstery. Attractive chrome-plated steel frame complements any office environment. An office essential! Convenient, space-saving chairs stack up to eight high when not in use. Padded seat and back with durable acrylic upholstery for comfort and long wear. 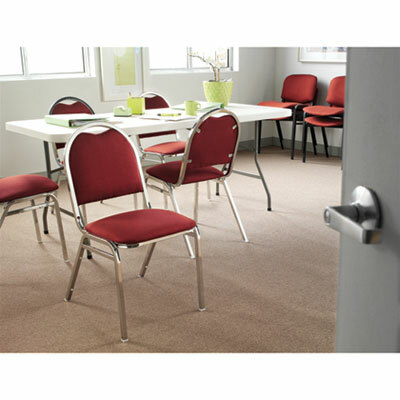 Attractive chrome-plated steel frame complements any office environment.